Gorgeous apartment, air con, communal pool, wifi, BBQ, sea views, garden, lift, private parking. 80 metres from the beach and 10 minutes from the Marina. Close to all amenities but in a quiet street. Beautiful and modern one bedroom apartment just 80 metres from the beach. 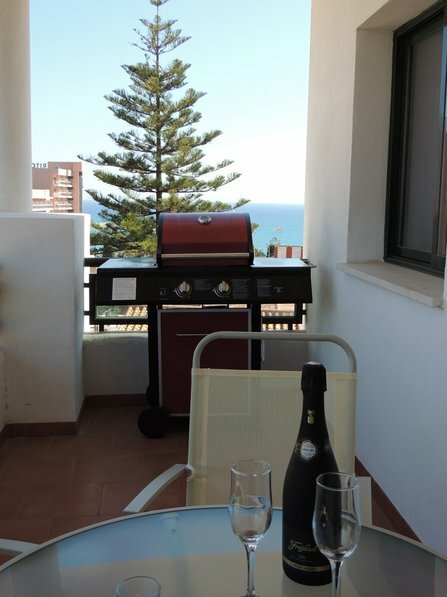 The apartment has one bedroom, bathroom, living room, kitchen, air conditioning, wifi, barbecue and lovely terrace with beautiful views of the sea. There is a communal swimming pool, garden, lift and private parking. The apartment is close to bars, restaurants, shops and the marina but is located in a quiet street. PLEASE NOTE, THE PERSON MAKING THE RESERVATION MUST BE A MINIMUM OF 21 YEARS OF AGE. The apartment is in Benalmadena Costa which is to the west of Malaga and is 20 minutes by car or bus from the airport. It is 2 minutes walk to the beach and 10 minutes walk to the famous Marina which has many international restaurants. You do not need to hire a car at this apartment. Baby beds and baby chairs can be provided. Please ask when you make your reservation. Enjoying fantastic weather, an amazing setting and beautiful restaurants, bars and cafes. Benalmadena is well positioned to reach Granada, Seville, Cordoba, Gibraltar and Ronda within a few hours drive. The city of Malaga is beautiful with its historical old town and very glamorous Calle Larios with trendy shops and boutiques also the Picasso Musuem. The picturesque Mountain Village of Mijas with its famous donkey taxis is just 15 minutes drive. You can also easily visit the elegant suburbs of Puerto Banus and Marbella and travel further on to Gibraltar.